One of the things I look forward to everyday is an email from MyRecipes.com. As I'm scrolling through and deleting the 80+ shopping emails, I stop and read which recipe MyRecipes.com has picked out for my 'Dinner Tonight'. It's my daily treat, and sure takes the guess work out of looking for new recipes. If you haven't already, make sure you sign up for their daily 'Dinner Tonight' newsletter! That's how I came across this recipe for Lemon Pepper Shrimp Scampi. The great 5-star reviews it got sealed the deal, I definitely wanted to try this! When I think of shrimp scampi, I automatically think of butter, loads of it! Which doesn't fit well into my attempt to eat healthier these days. However this recipe doesn't call for much butter; all in all, I think I used 2 1/2 TB for 4 servings. This recipe also differs from the usual ones as it calls for Orzo instead of long pastas. 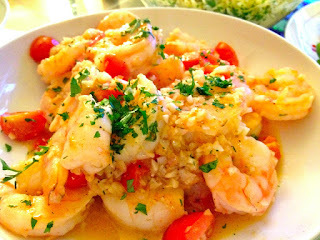 It had fantastic flavor and is a healthier take on many of the shrimp scampi's out there. Easy and quick too, check out how mine came out! Begin by cooking the Orzo until al dente. (Move on to making the shrimp scampi in the meantime). When the Orzo is done, drain and move to a large bowl. Toss with 2 TB chopped Parsley, 1 tsp Olive Oil and a pinch of salt. Set aside and keep covered until you finish cooking the shrimp scampi. While the Orzo cooks, sprinkle a pinch of salt over the shrimp and toss to mix evenly. Melt 1 TB of Butter in a skillet over medium-high heat. Once the butter heats up (~30 seconds), throw the shrimp in and cook for 1 minute on each side (until it begins to get pink on both sides, but not fully cooked). Be careful to not overcrowd your skillet; if needed, cook the shrimp in two batches. Set shrimp aside on a plate. Heat remaining Butter in skillet. Scrape any browned bits left in the pan from the shrimp. Add the garlic and sautee for 30 seconds. Add the Shallots and Cherry Tomatoes, cook and stir for 1 minute. Toss back in the Shrimp, and add the Lemon juice and black pepper. Stir and finish cooking the shrimp for another 1-2 minutes. Sprinkle fresh Parsley over the shrimp just before serving. Serve the shrimp over the Orzo, and add a side of steamed vegetables to complete the meal. Delicious! Lemon Pepper Shrimp Scampi served over Orzo, with a side of steamed string beans and mushrooms! Give it a try and let me know if you love it too! So beautifully plated. What a great recipe for a healthier shrimp scampi.